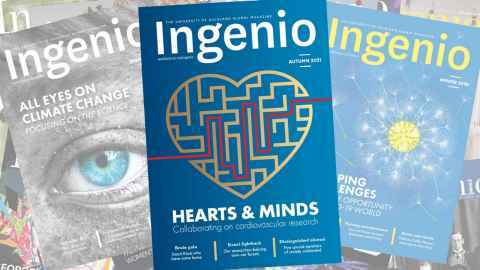 Download current and previous editions of Ingenio as PDFs. Ingenio Spring 2018. Size: 36.2 MB. Type: PDF. Download this PDF file. Size: 36.2 MB. Ingenio Autumn 2018. Size: 54.3 MB. Type: PDF. Download this PDF file. Size: 54.3 MB. Ingenio Spring 2017. Size: 19.4 MB. Type: PDF. Download this PDF file. Size: 19.4 MB. Ingenio Autumn 2017. Size: 4.4 MB. Type: PDF. Download this PDF file. Size: 4.4 MB. Ingenio Spring 2016. Size: 6.1 MB. Type: PDF. Download this PDF file. Size: 6.1 MB. Ingenio Autumn 2016. Size: 5.3 MB. Type: PDF. Download this PDF file. Size: 5.3 MB. Ingenio Spring 2015. Size: 3.5 MB. Type: PDF. Download this PDF file. Size: 3.5 MB.